This exciting sporting competition began in 1999 and has turned into one of the most popular Club Night activities on the calendar. It is usually held in October each year. The event sees teams from AROCA compete against teams from the FIAT Club of Queensland for the privilege of being custodian of this handsome perpetual trophy. While the FIAT Club is considered our sister organisation - united in a shared love of fine Italian motor vehicles - this doesn't prevent the Bocce Challenge being fiercely contested each year! All AROCA and FIAT club members are invited to participate. Age (our youngest player has been 7) or ability is no barrier as coaching and hints are provided by professional Bocce players. 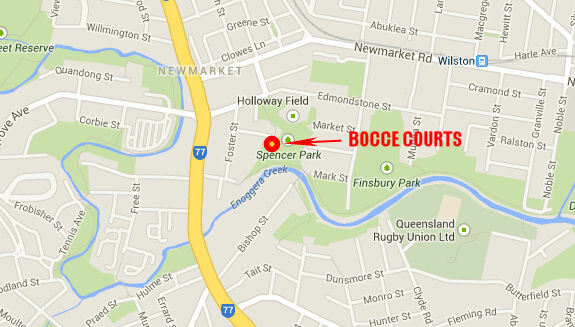 The excellent Bocce courts used for the competition are located adjacent to Spencer Park, Newmarket. See map below - enter via the Foster Street carpark of the International City Church (formerly the Italo Australian Centre). Come along and join us for a great night! 2018 - Alfa Romeo 2019 - ?? ?